In the bowl of a countertop mixer with the paddle attached, add the butter and shortening. Cream together on medium speed for 2 minutes, or until well combined. Add brown sugar and granulated sugar and mix on medium speed for 1 minute, or until well combined. Add egg, pudding mix, and vanilla and mix on low speed until fully absorbed. Add the flour, baking soda, cornstarch, and salt. Mix on low speed until well combined. Add the chocolate chips and pecans (optional) and mix on low speed until combined. 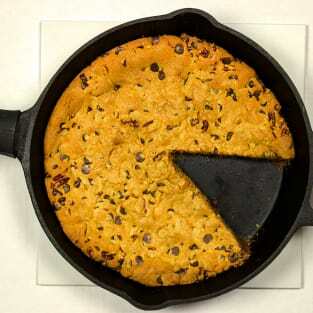 Press the dough evenly into a large (12”) cast iron pan. Bake at 350° for 32-35 minutes or until the edges of the cookie just begin to turn brown. Remove cast iron pan from oven and let cool before slicing.